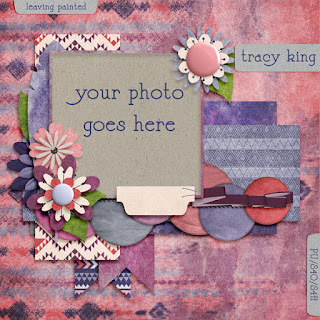 Atelier Tracy K.: Free Digital Scrapbooking Quickpage! Today I have a free quickpage for you to download. To use it you will need a program that is capable of layers such as Photoshop elements or gimp. Gimp is free and I am sure there are many other programs you could use. Just add your own photo behind the quickpage then add a layer above and type out a few details that you want to remember and voila! A super cute and stylish memory that you can even print and frame or upload to a site like Shutterfly and have it professionally printed in a book. Today I also have a treat for you. Hassle free downloading!!! No more going to media fire for my sweet followers. Now you just have to click on the preview or the link, whichever one suits you best. I used both my Leaving Home Patterned Papers found here. and my new Leaving Home Painted Papers and Elements which will available Friday here. So now onto the freebie. You can grab it here. Please tell all your friends and share as much as possible to keep the freebies coming. Also free to link to my post but don't share the freebie itself. In other words send people to this post to download the quickpage. Awesome QP and loving the colors, thanks a bunch!